Was there a theme? Tell us about the décor! Bec and Callum decided to opt for a modern and classy themed wedding! The glass chapel added a breathtaking dimension to the modern feel and the abundance of white roses filled the room with an air of romance. 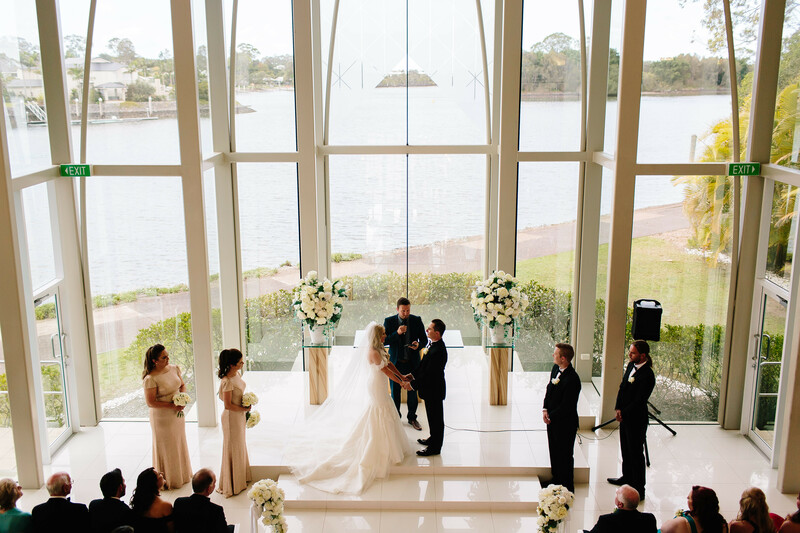 The Intercontinental Sanctuary Cove was the perfect venue; from the chapel to the stunning paved gardens, and romantic ball room. The reception area was lit up with intricate fairy lights to create a soft and romantic atmosphere where guests could relax and celebrate the night away. The colour scheme was a mix of neutrals and striking greens which felt refreshing and beautiful. The white Triumph Renown made for a gorgeous wedding car and really added something special to the wedding photographs too! This classic car really conveyed the classy vibe of the big day and its white colour made it feel modern and romantic – perfectly in fit with Bec and Callums big day. “I had always had my heart set on a mermaid gown. It fit perfectly and I felt amazing in it. After searching all over the coast and in Brisbane for the perfect dress I had made a trip to Sydney to find something. That trip was unsuccessful and so I made another trip to Melbourne in my search (a task which felt like it was never going to end)! I visited both boutiques (Brunswick and Armadale) and I realised that I had gone from not being able to find anything I liked to having too many choices.